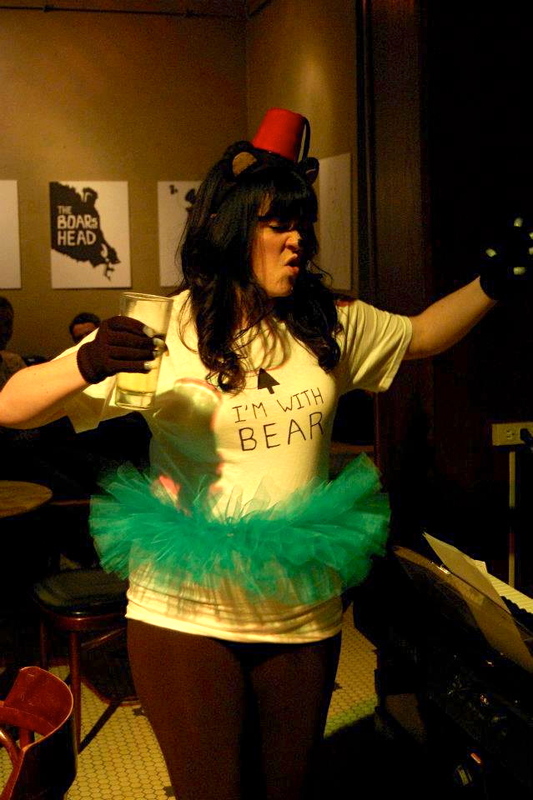 Allison Page shares her thoughts on the phenomenon (or bearnomenon) of performing in “BEEEEEAAR!” by Megan Cohen and Directed by Meg O’Connor at this year’s Pint Sized Play Festival. Allison will reprise her role one last time at the San Francisco Theater Festival this Sunday, September 30, at 1 PM, at Faithful Fools, 234 Hyde Street in San Francisco. Check here to view the full schedule at: http://sftheaterfestival.org/. She’s never gonna stop dancing! I walk up to the bar at Cafe Royale to get a delicious glass of beer at the end of a long day, and some guy sitting at the bar turns to speak to me. This scenario repeats several times in several places; sidewalks, Walgreens, other bars. 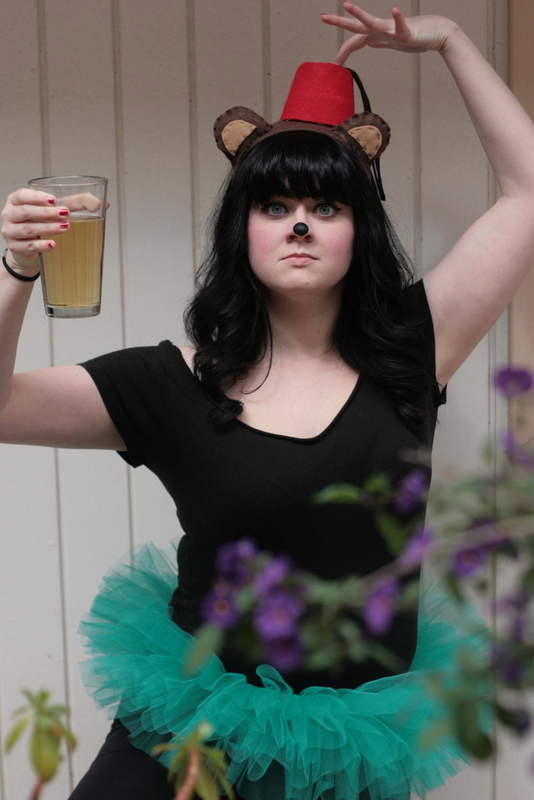 And I cannot deny it, they’re right, I am the Beer Bear. Hear me roar. I had never been a part of the Pint Sized Play festival or actually, anything Theater Pub has done, but last year I saw Pint Sized II because I had some friends performing in it. I thought “Ohhh, this will be…whatever.” (Yes, my thoughts are always genius and well-articulated.) But I had SO. MUCH. FUN. It was great. The Theater Pub atmosphere, and especially the Pint Sized atmosphere, has a fantastically different feel than any other theatrical event I’ve been a part of. So, when Meg O’Connor wanted to plop me into a piece she was directing for Pint Sized III this year, I said…”Yeah, sure, okay.” (I know, I’m brilliant.) I hadn’t even read the script for what was oddly titled “BEEEEEEEEAAAR”, but I trusted the title, the fact that it was written by Megan Cohen (And if Megan Cohen ever writes something and you can be in it, you should DO IT IMMEDIATELY. I always will.) the fact that it was about a bear, and the fact that I met Meg O’Connor once and thought she was nice. (She’s still really nice, and really awesome and funny and cool and easygoing.) It could have been a complete disaster. Instead, it was like lightning struck a cookie factory and the cookies went flying everywhere and everyone got to eat them for free and then get drunk. I don’t know what it is about Megan Cohen’s monologue of a world-weary, alcohol-abusing, depressed, lovelorn, lonely, deep, dark, hilarious, suicidal dancer-by-day, tutu-wearing, beer-swilling Bear that struck such a chord with people, but that’s what happened. Actually, now that I read that sentence, it sounds super kickass. We should have known. I don’t think Meg O’Connor will mind me saying that she had some reservations about directing “BEEEEEEEAAAR”, and I guess I can see why. It seems like kind of a tough cookie (Yay, more cookies! ), and it was sort of a shock the first time I read it, because, uh…WHAT IS THIS? !…but it was so well-written it just couldn’t go wrong. I dove right in and totally fell in love with it, and I’m not the only one. When I say I don’t know what it is that struck such a chord, I guess that’s not really true. I think I know what it is. It’s truth packaged in a digestible way (LIKE MAYBE IN A COOKIE?). Life is a dark, confusing beast. Bad things happen all the time, whether you deserve them or not, here they are, and they’re not stopping anytime soon. “BEEEEEEEAAR” is hilarious. Like, really, really amazingly funny. But in that humor lies something bigger. One of the best moments for me as the bear, hell, one of the best performance moments I’ve ever had, was getting into some deep dark moment of the Bear’s past and of the fragility of human mortality and how “…the hands of time and death must reach down and SCOOP UP THE ONES WE LOVE!” and a man in the balcony area let out a reflective “…Jesus.” Yeah. That’s right. Everyone you love and care about WILL DIE AND SO WILL YOU…now time for more jokes. It’s just the perfect combination of sense and nonsense, puns and truth, beer and poison, that give “BEEEEEEEEAAR” the strange cult appeal that it has. It’s been 2 months since I last donned that tutu and those fuzzy ears, but it seems like only yesterday that I was getting black-out drunk from all the free drinks bestowed upon me from excited audience members, who would sometimes be shy about it and not even admit to buying the beers I would find waiting for me after my intermission hibernation. I still get stopped on the sidewalk and occasionally roared at. And I always roar back. This is technically another play, called “Llama” but whatever… that guy never returns my calls. This entry was posted in Pint-Sized Plays, Shows, Uncategorized.